Growers and agronomists have to make a number of key tactical decisions, each season, in respect of their overall nitrogen management. These decisions include selecting the right rate based on seasonal conditions yield potential, applying the right source at the right time, and fertiliser price and profitability. Growers have seen low protein concentrations in these regions, which suggests that the optimum nitrogen requirements were not being met and therefore N is likely to have limited the potential yield. Big crops in the previous years, a dry summer and low frequency of break crops all are likely to contribute to a lower N supply. The 2013 season in the medium and high rainfall areas provided an opportunity to investigate N management strategies for growers. This is an opportunity to achieve yield potential at accepted grain receival standards for protein concentration – something not clearly understood by growers and advisors. The objectives of this project were to assess yield and protein responses to wheat to N rate, time and source in the high rainfall cropping zone of southeastern Australia. Eight farmers wheat paddocks were selected and three sources of N (UAN, liquid urea and urea) were applied at four timings of nitrogen application were GS32 (stem elongation), GS39 (flag leaf), GS55 (50% head emergence) and GS70 (end of anthesis). Two rates (25 kg N and 50 kg N) were used, and these rates were over and above the N used by the growers up until GS32. Grain yield and grain protein concentration were assessed at maturity. Across all treatments, there were yield responses at 3 of 8 sites, and protein responses at 5 of 8 sites. The responses at each site differ and only one site showed no response to any combination of N source, rate or timing. The mean response overall was 0.29 t/ha and a protein increase in 0.5%. For the majority of sites GS39 was the key timing to influence yield, and there were no differences between product type, and rate had a small effect with the higher rate of 50kg N/ha just having a higher yield than 25kg N/ha. This timing is slightly later than we have previously thought for applying nitrogen for yield, with GS32 being the recognised standard. The data in this trial needs to be interpreted with the 2013 season in mind, as a tighter finish in the spring could mean plant uptake of late applied N could be limited. The most significant outcome from this series of trials was the very strong effect seen to increasing grain protein. In nearly all cases the higher rate of nitrogen at 50kg N/ha had a more significant effect, as did delaying the timing until GS55. Product type had very little effect on increasing grain protein, but this may well have been influenced more by the softer finish to the season that most sites experienced. The late application at GS70 was just too late to impact on grain protein, irrespective of rate or source. Apply N early (stem elongation) for yield and later (head emergence) for protein. 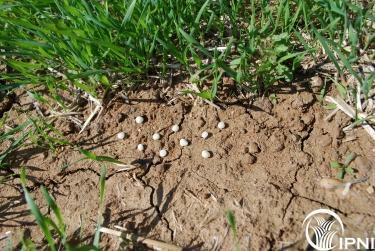 Nitrogen decisions should be made as the season unfolds because a good finish can make all the difference. Even in seasons where the finish is good, there is no single strategy to achieve grain protein above 10.5% with a high yield. While early N can establish a platform for high yields, the right combination of source, rate and timing to take advantage of any premiums still relies on a little luck with the conditions that follow application.